At the third new production of opera at its reconstructed Main Stage, the Bolshoi Theater recently presented Pyotr Tchaikovsky's "The Enchantress," a work seldom performed since its premiere in 1887. The reasons for the opera's neglect became readily apparent at the Bolshoi's opening-night performance. Of all Tchaikovsky's mature operas, "The Enchantress" must surely rate as the most dramatically unconvincing and, with the possible exception of "The Maid of Orleans," the least compelling musically. With a libretto by one Ippolit Shpazhinsky, based on his own play of the same name, "The Enchantress" tells a rather preposterous tale of tragic events in and around Nizhny Novgorod during the late 15th century. A young widow named Nastasya, popularly known as Kuma, keeps an inn on the banks of the Oka River and is thought by some to be a witch. Told by his stern adviser, Mamyrov, that the inn is a place of "cavorting and devilish merrymaking," the governor of the province, Prince Nikita, comes to inspect it and finds himself entranced by Kuma. His wife, Princess Yevpraksiya, gets wind of her husband's infatuation and informs their son, Prince Yury, who swears to kill Kuma. Nikita visits Kuma in her hut, but finds his advances rebuffed. Soon afterward, Yury arrives, knife in hand, but instead of slaying Kuma, he falls in love with her. The pair decides to elope, but Yevpraksiya beats them to their place of rendezvous and, when Kuma arrives, tricks her into drinking a glass of deadly poison. As Kuma expires, Yury comes on the scene, followed shortly by his father, whom he curses. In return, Nikita stabs his son to death. The curtain falls as Yevpraksiya is carried off in a faint and a raving Nikita falls lifeless to the ground. Performing "The Enchantress" in anything but a traditional manner would probably serve only to compound its dramatic weaknesses. And the Bolshoi, in its new production, has bent over backwards to give it a traditional staging. Indeed, when the curtain rose on the first act, I felt as if I had been transported back to the Bolshoi of two decades or more ago. Seated primly across the width of stage and dressed in spotless white was the chorus, the guests at Kuma's supposedly riotous inn, posed as if for the group photograph of a Sunday picnic. What followed was mostly more of the same, an acting-out of the story in the wooden Bolshoi style of yesteryear. Perhaps director Alexander Titel might have come up with a more imaginative staging if he had not been handicapped by the awkwardly sloped wooden platforms that served as the playing area within veteran designer Valery Levental's old-fashioned unit set and by a lack of real singing actors in three of the opera's most important roles. Musically, the best thing about "The Enchantress" can be found in its orchestra score, which has long stretches of Tchaikovsky's music at its most brilliant. Listening to the performance, I had a feeling that this was the main reason behind conductor Alexander Lazarev's choosing the opera for his return to the Bolshoi after a 17-year absence. Lazarev began conducting at the Bolshoi in 1973 and served as its artistic director from 1987 to 1995, achieving high regard for the firm authority he exerted and his insightful musical interpretations. Both those qualities were readily to be found in his leadership of "The Enchantress," and the Bolshoi orchestra responded with truly magnificent playing. "The Enchantress" has some fine choruses of folk-like melody and a few captivating lyrical episodes for the soloists. But otherwise, its vocal writing can hardly be called top-drawer Tchaikovsky. Kuma stands alone as the opera's only truly sympathetic character. Soprano Anna Nechayeva, however, seemed unable to convey much cause for compassion until nearing death in the final scene. And her voice was simply not powerful enough to meet the role's heavier demands. Longtime Mariinsky Theater soloist Valery Alekseyev, as Nikita, acted stiffly and displayed practically nothing of the vocal color and flexibility remembered from his fine performance in Sergei Prokofiev's "The Fiery Angel" at its Bolshoi premiere eight years ago. 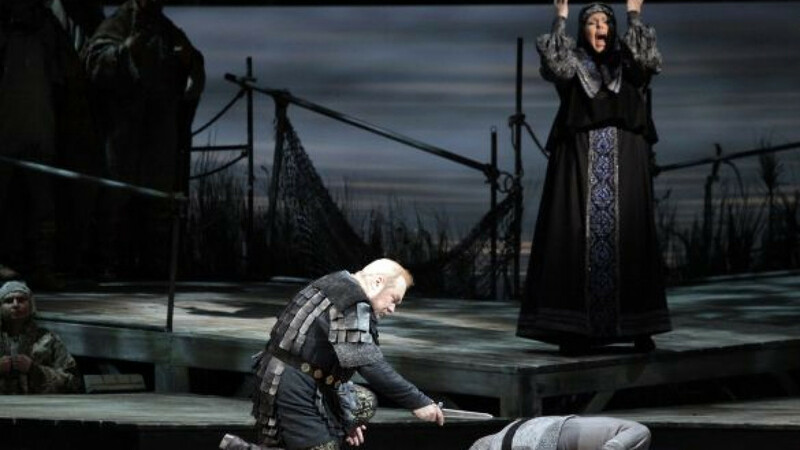 The role of Yury was meant for a dramatic tenor with a clear ring to his voice. Vsevolod Grivnov strove mightily with the music, but proved mostly underpowered and abrasive in tone. Moreover, there was nothing at all princely in his manner on stage. Redeeming matters somewhat were the brightly sung and appropriately distraught Yevpraksia of mezzo-soprano Yelena Manistina, and the Mamyrov of bass Vladimir Matorin, who, after nearly four decades on stage, remains as commanding a presence as ever and still solidly in possession of a rich, dark voice. "The Enchantress" (Charodeyka) next plays Sept. 15, 16, 18, 19 and 20 at 7 p.m. at the Main Stage of the Bolshoi Theater, located at 1 Teatralnaya Ploshchad. Metro Teatralnaya. Tel. (499) 608-7317. www.bolshoi.ru.